FAQ: Can I use WiFi with Android to monitor temperature, detect switch closure, and control fans, lights and irrigation valves? 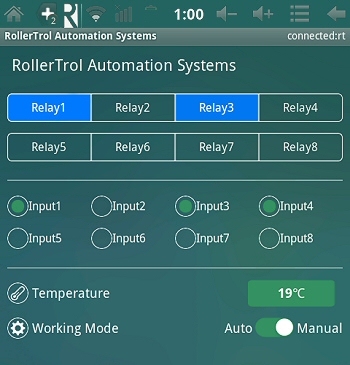 Our 12v WiFi monitor/control device uses an Android app to present sensing data and control relay outputs for motors, valves, lights, etc. It has four 2 pole 10 amp relays, with normally open (NO) and normally closed (NC) screw terminals that can be used to control fan motors, lights, and any other device that needs to be switched on/off. It can also accept four switch detection inputs, indicating the status condition of a switch or some other digital sensor with a voltage output. It also has a digital temperature probe on a cable that can be used to monitor temperatures in hard-to-access areas. This unit can be used as a very efficient controller as it can be powered down when not in use. Once it is configured, it will power up and join your WiFi network with its assigned IP address in about one second, ready for use. If you have an Android phone or tablet, and a wifi network in your home, you can control these relays and monitor the temperature probe via a wifi connection. 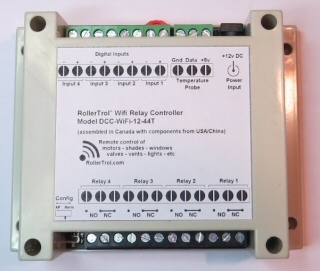 This is an article series on how to set up the WiFi relay controllers. The screen capture at left of our Android tablet illustrates the basic functions of this unit. The 4 relay buttons across the top activate each of the 4 relays, and the button turns blue when the relay is on (see R1 and R3). The extra 4 relay buttons are for future development. These relay control buttons are displayed by an active on-board circuit that electronically detects the actual relay status, which is sent by wifi back to the Android device. If there is a circuit fault preventing the relay from activating, the diagnostic circuitry will reveal the fault by not passing the status result (no blue color). The system will also detect the presence of a DC voltage applied to the isolated inputs (with a range of 4v to 27v). This can be used to detect indicators like switch closure, and there is an on-board +5v screw terminal source that can be used to power a detection circuit, or you could use the 12v power input, or some other device that has its own voltage source. The first 4 inputs on the captured screen will turn green when triggered (see input 1, 3, 4). The extra 4 inputs are also for future development. The temperature display fetches data from a probe tip installed on a 6 ft cable, which can be extended to monitor temperatures in areas that are difficult to reach. If the mode switch is set to 'Auto', the screen buttons will stop functioning, and the relays will be triggered directly by a voltage present on the corresponding inputs (4 to 27v DC).